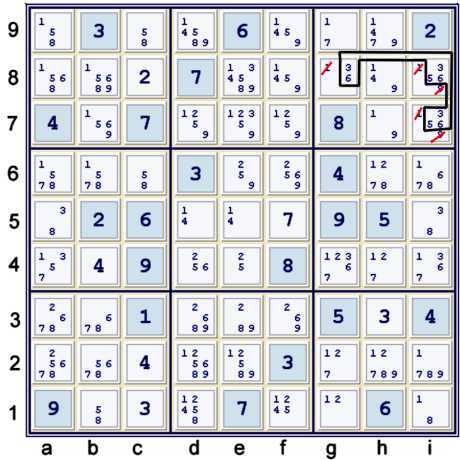 The following is an illustrated proof for the Tough Sudoku of April 3, 2007. A few Unique Possibilities are available here. They are included in the next illustration. Above, the naked pair 14 is illustrated as a continuous nice loop, or wrap-around, forbidding chain. One more cell is thus solved. the hidden triple illustrated above is not easy to find. One can also use the naked quad formed by candidates 1479 at cells g9, h789 to make the same eliminations. After making the eliminations, i2=9% column. (Hidden single, as only one location remains for 9 in column i). 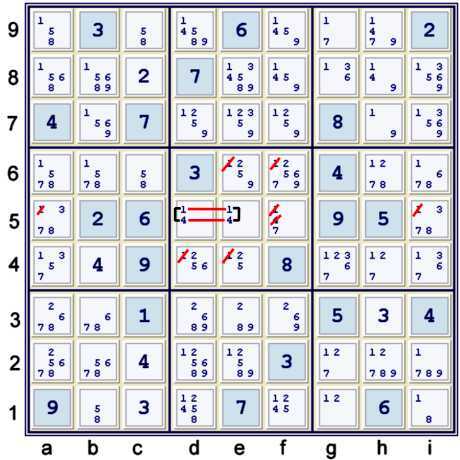 Illustrated above as a forbidding chain, or AIC, a few 7s are removed from box h5. 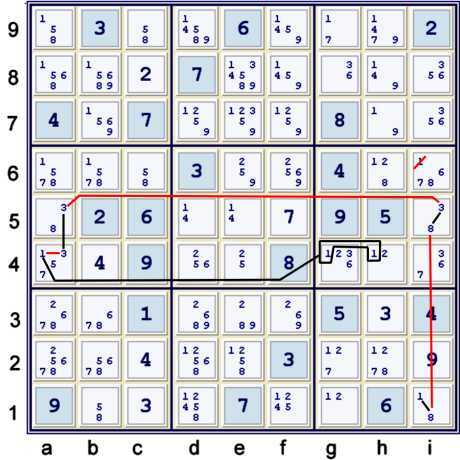 There are many additional such steps possible here, including some coloring eliminations with candidate 8. 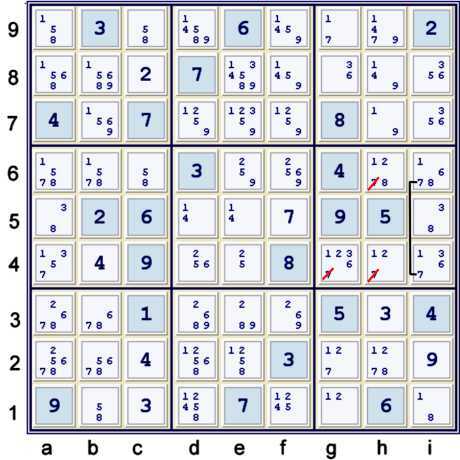 I struggled a bit here, finding many possible chains. Most of them were fairly deep. I am not sure why the following two chains did not immediately jump out at me, but they are very similar, and as such, not hard to find. The next chain uses three of the same strong inferences. After making this elimination, i1=1% column, followed by a cascade of Unique Possibilities until 41 cells are solved (UP 41). The puzzle is now reduced to a cascade of naked singles to the end. Time constraints will likely make blog pages more rare for the near future. 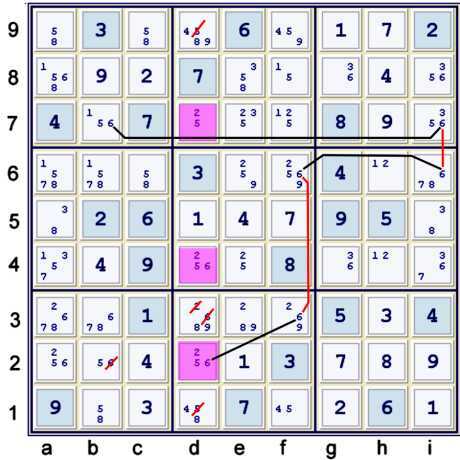 Please feel free to let me know if a particular puzzle is very interesting, as I may not have time to look at each day's puzzle for the next few days - but I would hate to miss a very interersting one! !